You know all those fortune cookie fortunes sound better with the ending "in bed." At least the adult version (or if you get a fortune like I did, "You will get caught", not fun reading in front of the wife). When it comes to the NHL, there is no doubt it is better with the post saying: "In the Playoffs". The Hockey News is a magazine someone subscribed to me eons ago and it normally finds a home on the back of the throne. But perusing through the May edition of this year, I came across some numbers that astounded me and prove that things are better post regular season. I wanted to break down some of their numbers in their article "2010-2011 Playoff Pace" (on newstands now). The following numbers have been compiled to show the difference between the regular season versus the playoffs. Some increases are minor in size, some significant. But all prove the point that we suffer through 82 games to get to the beauty that is the Stanley Cup Playoffs. Reg. Season: 92.7% vs. Playoffs: 101.2% - Okay, just about every team in the top three or four in the conference has boasted sell out crowds leading up to the end of the season (if not all season long). Let's take out the fact that the NHL only recognizes sold tickets and not turntables for attendance (if you were wondering, give away tickets do count as sold tickets). So even though a team could say it is a sell-out crowd, you may see a few of your fellow fans didn't make it to the arena. But in the playoffs the numbers seem to match more closely, tickets sold in this case really does mean butts in seats for a playoff game. Plus it's always fun to have more of your fellow fans to taunt, cheer and berate the action. Reg. Season: 5.46 vs. Playoffs: 5.54 - Goals are always a good thing, and this year even though the gpg is slight, the scoring has seen an increase most likely because teams once scored on are going all out to tie the game up. Not to mention we have seen a couple of really good 1-0 and 2-1 games this post season. So you would expect naturally this number would go up. Reg. Season: .524 vs. Playoffs: .135 - It certainly not due to the effort of the NHL to suppress fighting in the game, but rather an acknowledgement that a fight doesn't cure a badly played game. It also points to the need for four solid lines as each shift suddenly becomes more and more important. Guys are not settling old bets, they realize that they need to stay out of the penalty box or face the wrath of a really good power play. Besides, players have their whole careers to settle sore scores. Reg. Season: 45.5 vs. Playoffs: 60.9 - While the Playoffs are often called the sprint after an 82 game marathon season, a seven game series can be gruelingly long. Hits are all that more important as a team wants to tire the opposition and play physical hockey through out. Besides, you tell an NHLer he is in the playoffs and he is guaranteed not to forget to finish his checks. I am actually surprised the number isn't bigger. Reg. Season: 28.4 vs. Playoffs: 33.9 - Again, it is all about sacrificing the body. Players are understanding the importance of blocking shots. A puck that doesn't get to the net is a puck that doesn't end up in the back of one. I think Aristotle said that. Reg. Season: 18.9 vs. Playoffs: 17.3 - This number did surprise me at first. But once you really think about it, teams in the playoffs do not get there with out a good penalty kill. It's a slight decrease in part due to the amount of blocked shots go up (a trade off of sorts). The number is surprising considering the next stat. Reg. Season: 24.5 vs. Playoffs: 25.9 - It is surprising the number of penalties called per game has actually gone up, while the power play numbers are going down. You might say that the Officials might be calling the games tighter. But I actually think the opposite is true. Players are more apt to reign in an opposing player once they are beat and take the penalty rather than give up a quality scoring chance. I do think the Referees, for the most part, are letting some of the ticky-tac calls go and looking for the obvious calls. A player is not only scrutinized by fans and on national TV, but in the locker room as well by coaches. If a player gets beat on the ice, then he better do whatever he can to stop it from becoming a scoring chance which includes hooking the player or slashing his stick in two. Plus with the good PK's going around, why take the chance. Reg. Season: .913 vs. Playoffs: .916 - Goaltending only gets better in the post season. But don't take my word for it, look at what Roberto Loungo and Tim Thomas are doing. They are practically willing their teams to the finals. There is no doubt that the goaltenders kick it into another gear when Stanley's Cup is being flashed around. Some pretty interesting numbers for sure. But it all the stats can't take away from what these amazing athletes can push themselves to do. Save percentage is just a number compared to a "Hail Mary" stick save by Thomas in Game 5 can do. Or useless stat as blocked shots means nothing to Steven Stamkos' nose and three shifts later he is on the ice again. There is much more than numbers to prove how special the post season is. It is just nice to see that some stats seem to share that sentiment. HERSHEY – The HERSHEY BEARS announced today in conjunction with the NHL’s Washington Capitals that defenseman Zach Miskovic has been signed to a contract for 2011-12. The announcement was made today by BEARS President/GM Doug Yingst. Miskovic, 26, enjoyed a career-high seven goals and accumulated 16 points in 58 games this year for HERSHEY, his second pro season. A four-year letter-winner out of St. Lawrence University, Miskovic led all NCAA defensemen in goals during his senior season with the Saints. He originally signed with Washington in July of 2009, and has played in 11 career Calder Cup playoff games. His career-best seventh goal of the season came on February 6 vs. Manitoba. Face offs are so important. It can lead to a great offensive chance or fend off an attack in the defensive zone. 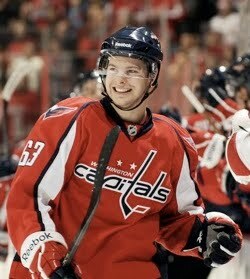 The Capitals did away with the league's best face off guy in David Steckel. 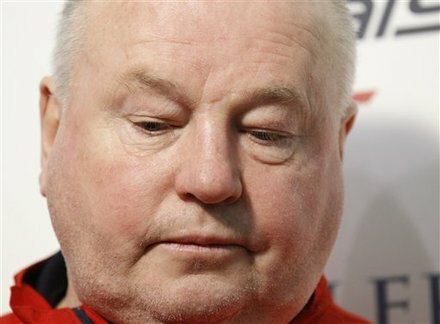 So Boyd Gordon picked up the reigns and was the Caps go to guy on the face off dot. He proved a useful face off man in the post season. He was first in the league up to the point the Caps were swept by the Tampa Bay Lightning. Gordon is a great defensive player. However he is far from a two-way player. Through 60 games, he has only tallied three goals and six assists in the regular season. 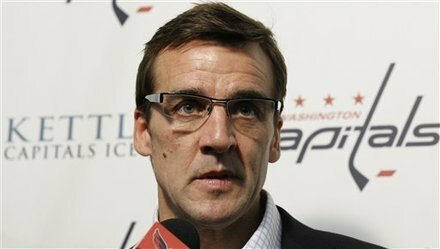 But the Capitals do not need Gordon to score, but to keep winning face offs for them. They might use him for some intimidation tactics because he has quite the mean scowl when he wants to use it. As long as he is healthy and keeps winning draws, Gordon will always find a spot on the Caps roster. Gordon proves to be a good defensive player and can hold down the checking line. His face off value is of real importance. The Caps do benefit from winning draws, especially in the offensive zone. His expertise is helpful. While Gordon's face off percentage makes him valuable he still hasn't cracked the top 30 in the face off list this season. He also has a nagging back injury that seems to conjure up at the wrong time. He has yet to play a full season. Gordon does not add much in offense either. The best he has done was 29 points in the '06-'07 season. His production has slipped each year since his career best season. The Washington Capitals looked at game three as a must win game to stay in the series. But their first power play goal did not help. Their first lead in the series did not help. A lead going into the third period once was chalked up as a win, but that did not help. Instead the Capitals have a mental brain cramp in the third period and the Bolts score :24 seconds apart to put the visiting team on the brink winning 4-3. 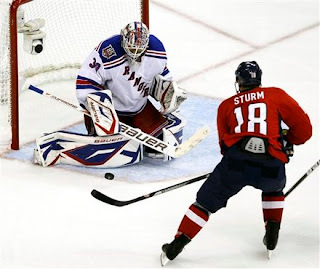 The Capitals do not seem to be playing the same inspiring style of playoff hockey that did away with the New York Rangers in five games. Perhaps their luck has run out. It is the little things they do not seem to be doing that is so important in post season play. They are losing battles along the boards, not passing crisply or quickly and failing to win battles along the boards and in front of the net. They are not going to the net, they are not grinding it out and they are making poor decisions with the puck. If Michal Neuvirth is on any other team, he would be outstanding. The saves the Caps' goaltender made should have been inspiring even in the waning moments of the game when the Caps were trying to get the game back to even. I am sure he would like back a few shots, like Steven Stamkos shot form the high slot, he seemed to far back in his net. But for the most part, it was the team in front of him that let him down. Again the Capitals were given some golden opportunities on the power play. While they scored on a 5 on 3 power play, they were zero for four on the rest of the night. Even taking away Mike Knuble's first period goal when a mental breakdown and six skaters were on the ice. It would have been the Capitals first period one goal and first goal in the game in this series. The Capitals are lacking some secondary scoring. After a brilliant first game and nearly scoring several times in game one, Alex Semin has all but disappeared from the post season. 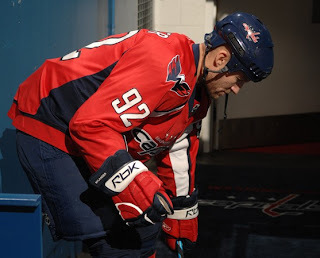 Out side of a good shot or two, he has become the biggest non-factor for the Capitals. They also have not seen any consistent offense from outside the top line. 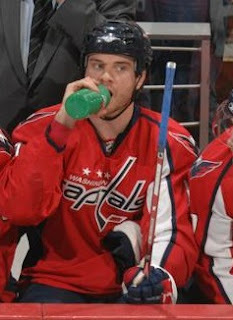 Mike Knuble scored first for the Caps in the second period to tie the game up and one. They would take a 2-1 lead on John Carlson's heavy slap shot. It would be the Capitals first lead of the series. It would not last long as Vincent Lecavalier, a thorn in the side of the Caps this post season, tied it back up about five minutes later in the second. But the Bolts got into some penalty trouble and the Caps score their first power play goal of the series on a 5 on 3 opportunity and go up 3-2. The third period doomed the Caps when Mike Green did not return. It shuffled up the defensive pairs and some miscommunication between Scott Hannan and John Erskine allowing an open shot for Stamkos in the slot that would beat Neuvirth. Then the Caps played poorly following the goal, not taking care of Ryan Malone in front of the Caps net and a centering pass bounced off him and into the net making the collapse of the Capitals in game three complete. The Tampa Bay Lightning have not won anything yet, it is still a seven game series. The Caps will have to drum something up in less than 24 hours if they have any chance of coming back in this season. But the odds are against the Caps, and there are more questions than answers after would could be a season that would see the mighty Caps swept in four games. Matt Hendricks was a healthy scratch for a second game in row. Brooks Laich, Alex Semin and Marcus Johansson were a -2 in this game. They combined for one shot in game 3. In franchise history, the Capitals have never come back from being down 3-0 in a playoff series. 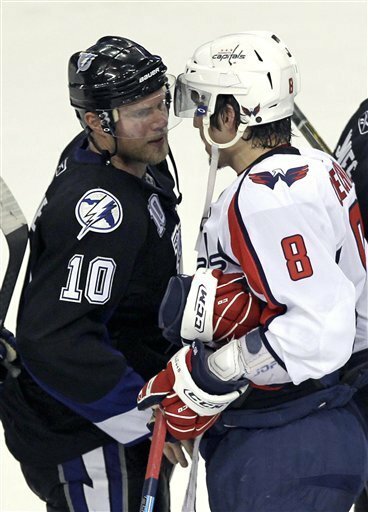 The Washington Capitals just kissed their home ice advantage good bye. Again the Caps could not come up with the first goal and found them selves trailing or tied in this series thus far. Vincent Lecavalier would be the hero scoring the early first period goal on the power play then ending the game just over six minutes into overtime. The Caps are left scratching their heads and looking to find a way to win on the road down two games to none after this loss 3-2.